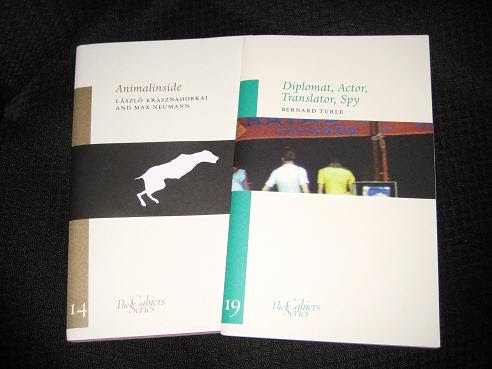 First today is Diplomat, Actor, Translator, Spy, a fascinating little pamphlet by French translator Bernard Turle (translated into English by Dan Gunn). In this short work, Turle talks about his life as a translator in twenty-six short chapters, one for each letter of the alphabet. The cahier is accompanied by photos from Gunn’s childhood (which, while sounding a strange idea, works well), making for a real bilingual collaboration. It’s a fascinating insight into the day-to-day life of a translator, and the changes brought about in this field by technology. Turle explains how the spread of the Internet has allowed for a new relationship between translator and ‘translated’ and discusses his growing relationship with the English language. It’s one he first describes as exciting (an escape from the realities of French) and later intrusive (an imperialistic tongue…). He also talks about how translation can sometimes be confronting as you can’t always choose what you need to translate (there’s some horrible, gut-wrenching stuff out there which some poor soul has to convert from one language to another…). The second of today’s choices will be of particular interest to many of my readers (well, those who have a passion for fiction in translation, anyway). animalinside (words by László Krasznahorkai, images by Max Neumann, translation by Ottilie Mulzet) is a short collaboration where the Hungarian writer reacted to the German artist’s surreal pictures of a dog-like figure (as seen on the cover). There are fourteen pictures, and for each there is one chapter, around two pages in length. While it may sound short and trivial, it’s anything but. From the very beginning, Krasznahorkai fans will feel themselves to be in very familiar territory. The text consists of long sentences, flowing powerful prose (that feels more like poetry). There’s a constant, dark feel to the monologues – menacing, threatening, and at the same time claustrophobic. These ideas occur over and over again, and the repetition adds to the sense of restriction.